Once I took a look at Scrivener I immediately could see the benefits of using it for a poetry manuscript. I spent a chunk of hours one afternoon going through the main tutorial, and then started using it and figuring out how to make it work for a poetry manuscript. It isn’t always easy, but Scrivener understands the writer’s need to organize and re-organize pieces of text, to categorize pieces of text in certain ways, and that’s why even while Scrivener sometimes gets confusing it’s actually fun to try to figure out how to make it work for you. This is a simple but brilliant function. Reordering is something most poets do constantly while working on a manuscript. When I first starting using Scrivener, I imported all my poem files from my current manuscript and dumped them into a “binder.” Now that each poem was living in my Scrivener binder as separate documents, I could easily drag each document and reorder the manuscript to my heart’s content. I keep all the documents for the manuscript in one folder with the manuscript title. When you’ve found the current order you like, you send the group of documents to “compile,” where you can export it to an RTF or PDF. Whenever you create a new order you like and want to save, you just “compile” it again (but see below in #2 about updating the TOC each time you reorder). No more cutting and pasting individual poems within a large Word doc! To create a TOC in Scrivener, you select all the documents that you want to include in the TOC, go to “Edit” –> “Copy Special”–> “Copy Documents as TOC.” Then you open a new document and paste. The TOC will format itself, and create poem titles based on the document names (so be sure to name those documents based on the poem titles). This is all in the main Scrivener tutorial. The TOC will not automatically update every time you move around or delete a poem, so you have to re-do the TOC every time you change the manuscript order. I don’t mind this, because it still takes out the hassle of creating a manual TOC in Word. This is super helpful when you need to use different versions of front matter based on a press’s or contest’s specific requirements. Some presses want to see acknowledgements or a title page with contact info, some don’t. I created two versions of the front matter, and when I’m ready to compile the manuscript to send off to a contest, I have the option to choose the front matter I want to include. And thankfully, the front matter doesn’t get included in the page count, which was something I couldn’t figure out how to get around in a big, single Word doc. To create front matter, add a folder called Front Matter outside the manuscript folder. Create the documents within the folder, i.e., Title (with contact), Title Only, TOC, Acknowledgements, Epigraphs, etc. Create a second folder, which I call Front Matter2, with the desired documents. During compile, choose the front matter version you want! 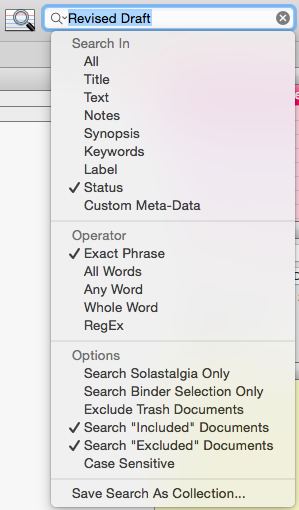 For each document in Scrivener, you can assign a status, i.e., first draft, revised draft, final, etc. You can easily create your own statuses as well. On the right-hand side of every document is a section titled Synopsis, General, and Document Notes. In General, you’ll see Label and Status, which both have drop-down menus where you can choose or edit the labels. 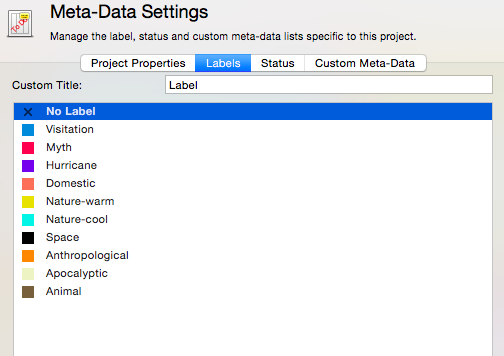 If you click on the drop-down menu in Status and click “Edit,” you can manage your classification system, or meta-data. I like to classify poems in the following way: Published, Maybe, First Draft, Revised Draft, Done. As you probably know, a manuscript is never really done. Sometimes it’s “done enough” to start submitting (which is where I’m at right now), but you’re still tweaking along the way. I might have submitted my manuscript to a few contests, and then later was like––why did I include those five or ten poems that weren’t really good enough? (okay, that actually did happen, and continues to happen every time I look at the manuscript anew). These are poems I’m just not sure are worth keeping, but maybe at some point I can revise and salvage them. But I don’t want to include them in my current manuscript submission. Recently, I went through my manuscript and started assigning the status “Maybe” to all those sad poems that have been around for a while and just aren’t getting any better. When I was finally ready to sort of let them go, I created a folder called “Maybe poems” and dragged them (kicking and screaming) out of my main manuscript folder. Then I created a new TOC and compiled a new manuscript with just the clean, finished poems from my main manuscript folder. I can always add back any Maybe poems by changing their status and dragging them back in, but they’re going to have to beg. Sometimes I want to just work on revisions, and it’s nice to be able to quickly find and view just the poems I want to revise. (I assigned the “Revised Draft” status for these poems, because they have been revised and I want to keep revising them. The “Maybe” poems, on the other hand, have been revised but are very close in my mind to being discarded completely or being saved by a miracle). You could get even more specific with the level of draft you’re on or how you want to classify poems by status, of course. To work on the poems that I think still have a chance at getting better, I created a search for my “Revised Draft” poems. 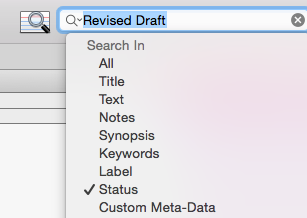 I typed in “Revised Draft” in the search bar, and then chose “Status” from the dropdown menu. Then I chose “Save Search As Collection” from that same dropdown menu, and, voila, I have a collection of my “Revised Draft” poems. I can now look at them on their own when I’m in revision mode. I’m also now doing this with my “Done” poems as a way to focus while submitting. These are the poems I’m pretty sure are totally done being revised (I know, you’re never totally sure), and therefore are ready to be submitted to journals. Now I can view them together as a collection and start figuring out where to send them! I can also do this with the poems that are already “Published” and designated as such, which is helpful for creating and updating an Acknowledgments page. This also allows me to easily count how many poems have been published, reminding me I need to send more of the others out! Instead of saving file after file of poems, as I used to do in Word, adding a number at the end of each file name to designate the draft, now I used Scrivener “snapshots.” These are easy to use and part of the main Scrivener tutorial. In Scrivener, you keep editing a poem in the very same document for it’s entire evolutionary existence, but you take “snapshots” along the way so you can refer back to earlier versions when needed. This is actually much simpler than looking through multiple Word files to find that one phrase you thought was great and you lost. This is fun. Most poetry manuscripts have themes that are threaded throughout. They may not be overt themes as in actual topics, but modes. When I print out and order a manuscript on the floor (which is still a great way to do it, but now that I’m using Scrivener I do it less often), I sometimes use markers to label poems with a particular color. In my current manuscript (which has some pretty clear themes) I have blue for cool/ice/snow-related poems, brown for animal poems, pink for myth-based poems, etc. I’m now using the Label feature in Scrivener to assign these labels to poems with colors. Here’s what some of them look like in Meta-Data (above) and in action in outline view (below). Pretty! But also really helpful conceptually. 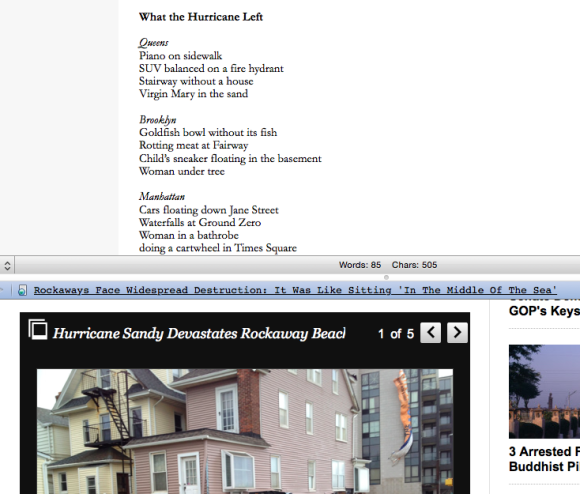 For example, do I really want to include those two icy poems side by side? It might work, but I might also consider spreading them out, as I’ve done with some of the other differently themed poems, so as not to have too many similar ones next to each other. Sometimes I have ideas about a poem, and it’s useful to write them down in the Document Notes section on the right-hand side of the screen. I never really used to do that before, and because Scrivener offers this functionality, it’s actually influencing my creative process. Sometimes I need to think things through off to the side of the poem, ask myself if the poem fits in the manuscript, or what threads it picks up on, or if I want the title of the poem to reference another poem in the manuscript, etc. You can also write Project Notes as well. Not everyone does research for poems, and it just so happens that for my current manuscript I am doing research (unlike my first manuscript which had zero research). So the Research section of the Scrivener binder is awesome. You can save all types of media including PDFs, web links, video, audio, etc. With the Research section I save articles and pictures, and then use the split screen functionality to work on a poem while referring to the text/picture that is inspiring me. So much fun! 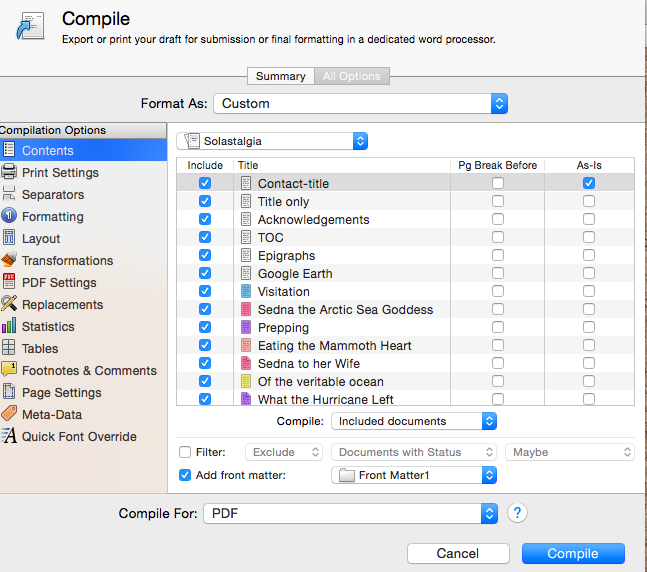 When you “compile” a manuscript to export from Scrivener to RTF or PDF, you can update the manuscript styles all at once. So instead of manually going through and changing the font or title style for each poem, you can focus on writing and revising, save formatting for the end, and do it all in one shot. I won’t go into much detail on all the wonders of the “compile” function, and if you’re already using Scrivener you probably have had the chance to play with this feature. Suffice it to say, it takes away a lot of the headache of formatting a complete manuscript of poems. I’ve only just gotten started learning how to make Scrivener work for my poetry manuscript. Please comment with any other tips if you’ve tried it! Happy writing! This entry was posted on Friday, February 20th, 2015 at 11:39 pm	and is filed under creative process, editing, Poetry, poetry manuscript, Scrivener, writing, writing process. You can follow any comments to this entry through the RSS 2.0 feed. You can leave a comment, or trackback from your own site. This is a great list. I’m always looking for new ways to use Scrivener, which is essential for my non-fiction work. Thanks for sharing! I love using Scrivener for my poetry! I pretty much save all my poems in it, and I’m working on making a manuscript now. Thanks for these tips… I’ll have to try out some of these. Especially like the color/theme idea. Thanks – this is really useful and I’m just getting into Scrivener now and can see all these fantastic benefits for working through my poetry writing from over the years. I’m wondering if you used, found or developed a poetry template or just used on of the generic templates? thanks for the information and tips – very helpful! Hi, Terri! I didn’t use or develop a template, but in theory that could be really helpful. The next time I start a new manuscript I may try to replicate what I did with this one. We’ll see! Glad the post was helpful! Thanks very much for this article. I recently put hundreds of notes and half-finished poems in Scrivener but got stuck here and there in the technicalities. It’s a big help. Excellent and practical tips… been using Scrivener for non fiction but never for poetry collections… I can see the multiple advantages. Thanks for your post! This post is so generous and so helpful. I booked marked it before and have come back to it now. The hardest thing about Scrivener so far is that all the icon buttons are miniscule because I’ve got such a high resolution screen. Boo. Otherwise, I’m really excited trying it out. THANKS! Thank you so much for your “Show and Tell” on how Scrivener would be useful to me as a Poet. Now I am sure I want to buy Scrivener once my free trial is over! After your explanation on how you use it, as a Poet, I can hardly wait to get started with the job of recording/compiling my hundreds of poems on Scrivener — poems I have written over the past 63 years, most of which are presently still in the notebooks where I first wrote them! Now I can see how Scrivener will make the process of re-writes, etc., far easier than using longhand, pen and pad — or Microsoft Word, Pages, and other such. Thanks again, and god bless you for your taking your time to advise and show people such as me — newbies –how to best go about things! Thank you for the tips…and reaffirming that some of the things I’ve tried also work for you – can see a couple of things to tweak based on your ideas. I purchased Scrivener for my partner who is a poet, but not “into” the techie stuff that can make life easier. I wanted to help her get collections together for submissions and found Word to be clunky so went looking for a solution. What a great find. She has been doing lots of readings at Open Mic nights and various slams so I also use “Document Notes” to indicate where and when each has been read so we don’t repeat (and colored label to easily pick them out of the Binder list); also for submissions to contests and the results. One thing I had hoped would work, but doesn’t seem to is using “Project Notes” for individual Collections – it appears to just overwrite an existing one if you add a new one. Or perhaps I’m not using PN correctly? Any suggestions? She came across this blog last night; my response was an immediate “send me the link”. I love being able to support her art in this way. Thank you again for the tips. Hi Dina. I’m glad the post was helpful! Unfortunately, I haven’t used the Project Notes function yet so I don’t have an answer to that question. Best of luck! Excellent post. Quick question. How do you guys use it for more than one poem? Do you just create another “Scene” page icon and type the poem in there? Then how do you format and title it according to the line numbers that appear once you compile? Hi, Max! To add a new poem, you click on the icon on the bottom left side that looks like a a plus sign — “create new document.” This creates a document within the existing binder. The binder is the full project you’re working within, the manuscript of poems. I’m not sure if you’re working in a fiction or drama template, though, because you mentioned “scene” page. I actually can’t remember what template I started with, it was either a poetry manuscript template or blank. As to the second question, I create a title page manually within the manuscript as a document page, but I’m not sure what you’re asking about titling it according line numbers? Can you clarify the question? The trouble is….in a way …it is TOO good; but that’s just the problem of it always forcing me to think of better ways to go about this. I am trying to collect the full catalogue of my poesy…going back to the ’60s…so it’s a big job. Have you used Scrivener as a database for your works in progress? I’ve got pile of poems, notes, and snippets saved as Notepad files and I want to organize them. I was just wondering if you’ve tried that. Hi, Scott. I don’t use it as a complete database for works in progress, but recently I started a new Scrivener project and put in all my new poem drafts. So in some ways I’m doing that. But having the poems in one project makes it feel like it will become a new manuscript, which isn’t necessarily what it will become. I’m curious to hear others’ ideas for using Scrivener as a database for all works in progress. Good question! I was wondering if there was a way to get all of my poems together for a potential manuscript and I ran across this article! Thank you for sharing. I will incorporate some of your ideas and see if I can put together my poems for National Poetry Month. 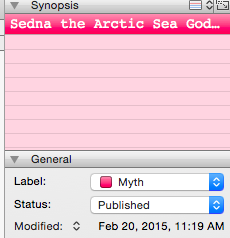 I’ve started using Scrivener for my other writing, (novel and blog) so this seems like a natural progression. My only question: Does anyone have a good template for poetry anthologies? I see Scrivener is being updated to 3. Does anyone know if they now include a template to format poetry in the center of the page for an entire manuscript? It has not been able to do that before I was told when I emailed them. Thanks for this great article! Hi Hila! After reading through your post, I purchased Scrivener. Seems fantastic, but I keep running into one problem: when I compile the poetry manuscript into word or pdf, the formatting goes awry and pages bleed onto each other. Do you know how to solve this? 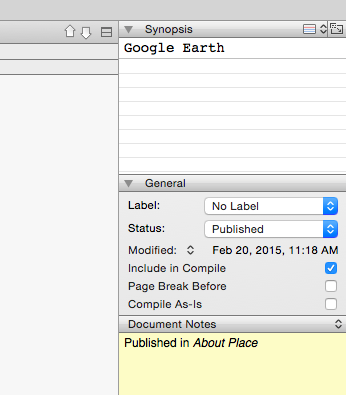 Also, can I make text boxes in Scrivener? Thanks! This article has helped me so much, Hila! I first found it a year or so ago and just upgraded to Scrivener 3. It has really influenced the way I work and I can’t thank you enough for taking time to share all your experience and insight into the poetic possibilities of this amazing software. My question has to do with compiling poem packets for submission. It’s easy enough to select 3-5 poems and compile them, but what I haven’t figured out is a quick way to include contact information at the top left of each poem—or not, since some journals want anonymous submissions. If anyone can help with this I’d be delighted! Thanks again, Hila! I posted this question on the Scrivener Help Forum and here are some solutions! Hi! Great article :). I’m new to scrivener and I want to organize my poetry/songs. Your examples are great. Would you be open to share your template? Or do you know where I can find one instead of starting from scratch? Just when I need to do this, I found your excellent article. I have been with Scrivener for some time but never thought about putting my poetry together in a Chapbook. Thanks for the article, and I will watching your blog.